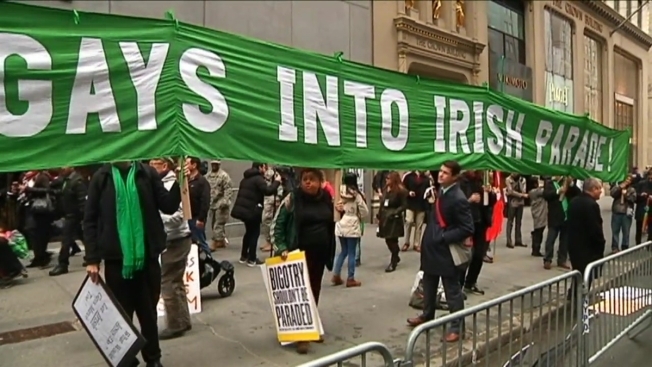 Mayor de Blasio announced Thursday he will march in New York City's St. Patrick's Day Parade for the first time since he was elected now that gay and lesbian groups can also participate in the celebration. De Blasio boycotted the parade in 2014, when no LGBT groups were allowed to openly march, and again in 2015, when Out@NBC became the first gay and lesbian group to march in the parade. “For two decades there’s been a blemish on New York City,” de Blasio, flanked by representatives from Irish LGBT groups, said at a press conference Thursday afternoon. The mayor was joined by Councilman Daniel Dromm, an openly gay man who broke down in tears as he spoke about the struggle of the LGBT community to be recognized by organizers of the parade. Both the mayor and Dromm evoked the influence Pope Francis has had on the culture of the Catholic church in regards to accepting LGBT Catholics. Francis’ message of inclusion, de Blasio said, helped set the tone for this year’s inclusive parade. The St. Patrick’s Day Parade is slated for March 17. It proceeds along Fifth Avenue in midtown Manhattan.